A South Korean expedition team has successfully crossed the Bering Strait for the first time on foot since a pair of Russians did so on skis in 1998, they said. The four-member expedition team, led by Hong Sung-taek, reached to the U.S. state of Alaska from Russia’s Chukotka Peninsula by crossing the Bering Strait in six days. The expedition started from the east coast of Russia on Feb. 24 at 10 a.m., Korea time, and arrived in Wales, the western coastal town in Alaska on Wednesday 8 p.m., Korean time, according to the head of the Korean expedition team. Hong, 46, who has climbed the Mount Everest and reached the North and South Poles, was accompanied by three other experienced mountaineers ― Jeong Chan-il, 34, Choi Jae-yeong, 29, and 28-year-old Jung Yi-chan. 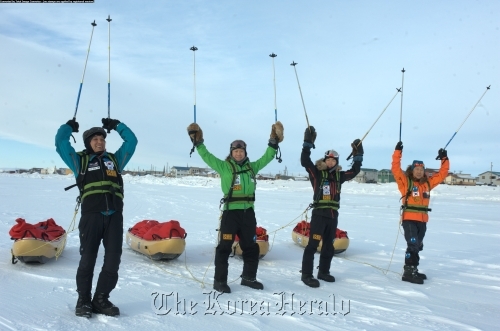 “It’s a truly remarkable achievement,” Yoon Tae-keun, head of the expedition team, told The Korea Herald. Speaking by phone from the base camp in Alaska, Yoon noted that all the members of the team had safely completed the expedition, though they had a number of incidents of frostbite during the journey. The Bering Strait is normally frozen during the winter months but sections of sea ice can thaw without warning. The waterway separating Asia and North America, though only 86 kilometers wide, has in modern times been crossed on skis only once, in 1998 by a pair of Russian adventurers. Korean mountaineer Park Young-seok, who went missing in the Himalayas last fall, had also attempted to cross it in 2007, but failed and was rescued at a point 27km from the coast of Alaska. “The Russians returned to their base camp during their expedition, and returned to the midway point by helicopter and continued on,” said Yoon. This time the Korean explorers were walking on foot, without skis, and sometimes swam across the sea, Yoon said. “This is first such expedition,” he added. The Korean expedition team is scheduled to return home on March 6.